It's great to be hearing Donald Ray Johnson again. I loved the last CD he sent me so much that I awarded "Pure Pleasure" the 2008 BLEWZZY AWARD. 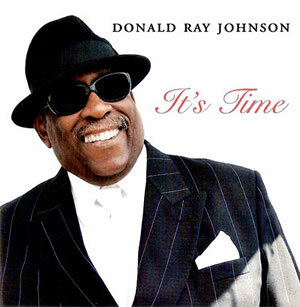 Now he's back with another contender - "It's Time". The many musical contributors are: Donald Ray Johnson on vocals, background vocals and drums; George Phillips, Bill Eaglesham, Chuck Byrne and Brent Wright on bass; Ralph Moncivais on tenor & alto sax solos; Ron Casat, Mike Little and Earl McCauley on keyboards; Alistair Elliot on trumpet; Mike Clark on sax; Dave Reed on trombone; Kent McCray on drums; Mike Huston, Brent Wright, Gaspard Ossekian, Russell Broom, Bill Johnson and Yuji Ihara on guitar; and Chris Aries on background vocals. Kent, Bill E. and Ron on the drums, bass and organ - not one, not two, but three guitarists provide some rhythm of their own. Fueling the fire are great guitar and sax leads by Gaspard and Ralph. We're off to a real good start here.